Here's how to keep the at their best. I always drink an oatmeal stout from a glass. That way I can marvel at its murkiness, impenetrable even when held up to light. I inherited my love of dark beer from my Oma Walter. No one else in my family would touch the stuff. And even me, as a child, couldn’t fathom drinking something so cloudy, black and mysterious — a mindset informed by living in a home where water-clear Labatt Blue was enjoyed in amber stubbies. But the bitter coffee and sweet chocolate synonymous with stout grew on me as I got older and every time I drank a dark beer that I really loved, I’d think of my Oma as she smacked her lips after a pleasurable first sip, looked upon her glass with approval, and said “Oooh, dat’s a gut beer,” in her German-flecked English. I also credit her with my appreciation for the cast iron frying pan. My maternal Oma was a pack rat. Not of the hoarder proportions that make for exploitative reality TV, but rather as someone who lived through the Great Depression, lost everything in the Second World War when her hometown was razed by American bombers, and then immigrated to Canada where she started life from scratch with her husband, young family and their meagre belongings. She found a use for everything. Kept clothes that went out of fashion because she knew they’d be trendy again one day. She was notorious for sparing every piece of gift wrap and matching bow a trip to the dump, neatly packing away what could be salvaged until the next gift exchange. And then there was a cast iron pan. It was my uncle’s from his days as a hippie living in Cape Breton at a place called the Banana Farm. There was no banana growing happening, but I’m certain he and his pals were prolific producers of another kind of crop. When he got serious about his law career, he packed his belongings into cardboard boxes and brought them back to Kitchener before work took him to Alberta and eventually British Columbia. When he headed west, he left those boxes in our basement until one day my parents had either tired of our house serving as his storage unit, or enough time had passed to void any sentimental value those boxes held and he gave the green light to toss them. In them was a cast-iron frying pan, rusty and in need of a patient hand willing to return it to its former, seasoned glory. That patient hand wasn’t my parents’. The pan was to be cast to the curb for the next garbage day, but not if my Oma could help it. She rescued the old skillet from our trash and hung it on a hook in our garage normally reserved for a rake or shovel. Rather than hang it flush with the wall, she threaded the hook through the handle so the pan stuck out just at head height if you’re 5-foot-6. It was my mother, all five feet, six inches of her, that later discovered my Oma had gone on her own Storage Wars mission in our trash. I was watching TV, my dad visiting with a family friend, when we heard a hollow-sounding crash and scream in the garage. My cast iron pan in need of seasoning. We ran to the door to find my mom hunched over, hands protectively cradling her head, her face red and eyes squeezed shut in pain. Our collective jaws dropped at the sight. My dad sputtered the question we were all dying to know the answer to: “Elke, what happened?” My mom pointed to the cast iron pan, laying on the ground next to her before she unclenched her jaw enough to let every four-letter word a child my age should never hear spill from her lips. Turns out, she bent over to put something in the recycling bin, stood up fast and sharp, knocking her noggin on the pan with such force, it flew off the hook, landing with an unceremonious clatter at her feet. She peered up at us through one eye and in that moment, all tension broke as she started quaking in laughter at the ridiculousness of it all. We followed her lead. Still, that pan didn’t get a pass. It was ceremoniously chucked — buried beneath the week’s detritus in a garbage bag so Oma wouldn’t find it — the next time the garbage truck came rumbling down our street. I wish I had that skillet now. I’d fix it up, get it looking and cooking like new. I cook with my cast-iron pans so much, they’ve made their way to the top of my desert island list. I appreciate how they heat up evenly and get really hot, even at low temperatures; how long after the burner has been turned off, the pan’s contents are still piping if I go back for seconds. And I love giving my pans the TLC they need to be the original no-stick skillet. 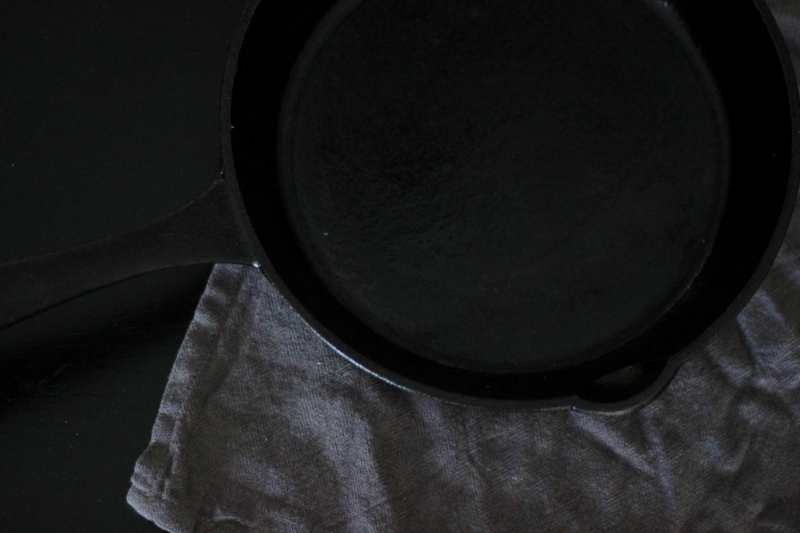 I’ve heard every possible method of caring for and seasoning cast iron to keep it rust-free and I’ve tried them all. I avoided soap and water at first, using salt and a stiff brush, even a potato cut in half, to keep it clean. Neither worked. This might make me a barbarian, but I now clean my skillets with a bit of soap and water after every use and I don’t have a speck of rust on any of them. And because of that, I also don’t eat food that’s black and tastes like last week’s latkes, like those who eschew the soap and water cleaning method for their cast iron. I’ve also heard it all about seasoning, from simply spreading oil around the pan’s porous surface after cleaning, to cooking an oil-water mixture down on a burner. None of them have worked as well as the coat-and-bake method espoused by Kaufmann Mercantile. 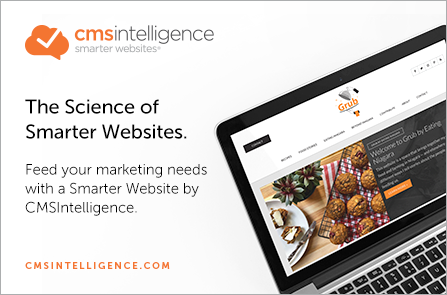 The website was founded by German Sebastian Kaufmann, who started blogging in 2009 when he took an interest in how things were made, and how to maintain or fix them rather than tossing and replacing them. Stemming from that, he started selling products made from sustainable materials and built to last — or be repaired should anything go awry. All of this culminated in a book, The Kaufmann Mercantile Guide: How to Split Wood, Shuck an Oyster, and Master Other Simple Pleasures (Princeton Architectural Press, $33.95), which serves as both a catalogue for Kaufmann’s wares but also as a how-to for actions you won’t do often, but when you are required to step in and, say, sabre a bottle of champagne, you’ll look and feel like an ace thanks to this book. The guide holds the secrets to mastering 48 life skills, from shucking an oyster to smoking food, pruning in the garden, making soap and growing healthy house plants. Skills are divided into five sections: kitchen, outdoors, home, gardening, and grooming, and along with written instructions, there are helpful illustrated steps, too. It's brilliant in its simplicity, much like the type of living that Kaufmann himself champions. Among his life lessons is what I’ve determined to be the best way to care for cast iron after following — and abandoning — the advice of others, including some heavy culinary hitters for whom I was sure this would be second nature. So without further adieu, do this with your cast iron and you’ll have a family heirloom in your midst rather than one day’s trash. Excerpted from The Kaufmann Mercantile Guide: How to Split Wood, Shuck an Oyster and Master Other Simple Pleasures. Published by Princeton Architectural Press. Copyright © 2015. Excerpted by permission of Raincoast Books. All rights reserved. With notes in bold by me. Put the pan on the stove over medium heat for three to five minutes to heat thoroughly. Then add cooking fat and throw on your ingredients. If a pungent smell arises while cooking, this could be a sign that the pan wasn’t cleaned well enough between uses. So, after cooking and once the ingredients have been dished, immediately run your pan under hot water. (Cold water can potentially cause cracking or damage because the the outer layer of iron contracts faster than the inner core.) The thermal shock will do away with most of the residue and rinses the surface of any oils. If there are still bits of food left in your pan, give it a scrub with half a cup of coarse salt and rub with a sponge. This will clean the pan without compromising the seasoning.